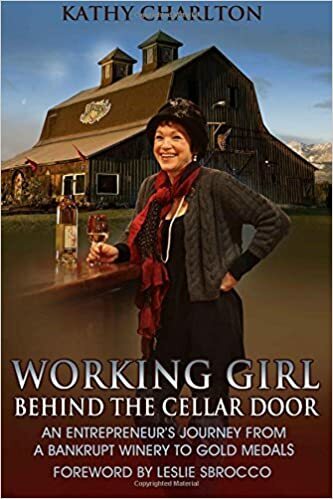 As you walk through the doors of our winery and are greeted by the ‘Working Girls’ of Olympic Cellars, it’s obvious the personality of the women behind the winery and our best known wine brand, Working Girl Wines, drive a non-traditional persona of contrasts not only in the décor and events at the winery but also in our wines. Beginning with an enormous, century-old barn (the winery’s home), the weathered old cedar is adorned with massive barrel-shaped copper doors you might expect to see in a monastery. Out front, a vineyard angel welcomes you... with her wine barrel-body adorned in a grass skirt and wearing pink rubber boots! The barn smiles at night through stained-glass copulas that tower above the landscape. And one of the most popular winery photo op’s is none other than -- the women’s bathroom (really, words can’t do it justice!). The tasting room… well, saying it’s definitely got a women’s touch is an understatement. But add in a stunning, 19-foot, century-old bar and men suddenly feel right at home, too. The “Gathering Room” (no VIP room here) is just that… a place to gather. In the center of the room is an 8-foot hand-crafted farmer’s table made with rough-huned cedar planks off our barn. And behind it -- a spectacular silk wall hanging, “The Promising Vendange,” our vision of vineyards on the Peninsula, commissioned from a local artist. There’s the traditional winery events like wine dinners, of course. But sharing equal billing is our celebration of National Flip-Flop Day and our contest for the best Chocolate Chip Cookie & wine pairing (and don’t forget the Working Girl First Jump Club, all you have to do is tandem skydive!). Contrasting Wines ? Of course, in style AND variety. 3 brands, 17 different wines. Gazing around you notice a shelf displaying our wines loaded with medals and awards. Yet pan the wine racks stretching half the length of the room and you’re a bit jolted as you spot all the ‘Twilight’ books sharing space with a stack of Wine Spectator magazines. And what this? A Double-Gold Medal winning Syrah parked right next to a Sparkling Syrah (a.k.a. our new Sparkling Twilight!). Some in the industry probably question my sanity and might not take us seriously… a small winery producing just 3,500 cases of 17 different wines. Most wineries our size or smaller generally specialize by style or grape varietal, bottling maybe 4-8 different wines. But after the first couple of years owning the winery and working behind the bar every day, I made the unconventional decision to make a wide variety of wines and styles because that’s what people who stopped wanted. It’s a decision influenced by my own ‘wine journey,’ my learning this business from an outsider’s perspective and from my Mer-LOT guests (these are three separate stories, all with the same ending, but for later blog posts). Don’t get me wrong. I’m dead serious about my wine in the cellar. But as you pass through the doors into the tasting room, it becomes an atmosphere that’s fun, inclusive and welcoming. As our guest, you get to select wines for tasting based on your own personal tastes, not ours. This decision doesn’t mean in any way that I will ever sacrifice quality. I want it all. Awards, industry recognition, the best grapes. Benoit and I have had many discussions about this business model. I know it’s tough for him in the cellar. Even in an abnormally cool summer when local Peninsula grape production was only 100 gallons of wine (realistically, too little to even bother with), I didn’t care. Making wine from Peninsula-grown grapes is part of my vision and unless the quality was compromised then the extra effort for this tiny production is just part of the deal. And Benoit makes it work, producing small, hand-crafted lots of premium wines for you to enjoy. This year, our 30th anniversary, we will pour what may be the best wine that has ever come out of our cellar, a 2007 Cabernet blend. It’s dedicated to our founder, Gene Neuharth. And yes, it’ll be poured right next to a small batch of locally-grown Muller-Thurgau infused with Peninsula culinary lavender. And then we’ll toast it all, of course... with a cold glass of Sparkling Twilight! It’s who we are, just three working women from very different backgrounds, running a winery... our way. And hopefully inspiring you to embrace contrast... and do things... your way!